Wait, What’s a Zoned System? You might be wondering what zone-controlled heating even is. Zone controlled heating is heating that breaks your home into factions or “zones” for more precise heating. Each zone is controlled separately by a thermostat. When you zone your home, you can eliminate stubborn hot and cold spots and save money by only heating or cooling the spaces you need when you need them. Wondering how a zoning system works? A zone-controlled system uses a control panel installed at your furnace to control the opening or closing of dampers. Dampers are the valves in your ducts that open or close to let in more or less air to certain areas of your home when you need it. The last component that goes into a zoned system is the zone thermostats. Each zone gets a thermostat to monitor a certain area. The individual thermostats report back to the control panel and open the dampers throughout your home as needed. Even Temperature: Most homeowners put a zone-controlled system in their home to eliminate hot and cold spots. If you live in a two-story home, a home that receives a lot of natural light, or a home that’s heavily shaded by foliage or trees, you can probably benefit from zone-controlled heating. 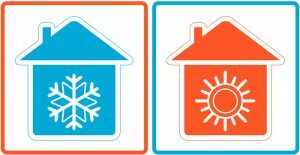 All of these factors change the way you need to heat or cool your home. To accommodate this need, a minimum of two zones are installed (typically one in the front and in the back of the home or one on the first and second floor) to keep your home evenly temperature controlled. Cost Efficiency: Do you live in a two-story home where you like to run the heater at night to make yourself warm during winter? You likely have your bedroom on the second floor but have to heat the entirety of the first floor when you run your heater. You can completely avoid this issue with a zone-controlled system. On cold winter nights here in South Carolina you can simply run the heater on the second floor of your home while letting the first floor remain unregulated temperature wise. This allows you to cut the cost of heating spaces you don’t need. If you’re looking to install a zoned controlled system in your home this winter our team can help you with any inquiries. Contact Fulmer Heating & Cooling today to schedule an appointment.